I think putting Amy Winehouse through rehab would be cheaper than rehabilitating this dog... unlike Amy, if rehab doesn't work he will get put down, I said no, no, no. In an attempt to tip the odds in our favour I have upped the ante with his nutrition. Vets Choice dog food is out, and Royal Canin German Shepherd Puppy food is in (nogal), with 7.5ml of Efazol once daily. Although there is no noticeable change in his physical condition he is definitely happier. He has noticed the toys in the garden, unsurprisingly his favourite being a stinky cow hoof which he tosses up and rolls around with. He got hold of a cardboard box today and seemed to have loads of fun ripping it to shreds (pity he can't pick up the pieces off the lawn). He also has a tennis ball but went into some sort of canine shell shock when I threw it (probably flash back to being pelted with stones), if I kick it across the lawn he will sometimes chase it, paw at it and occasionally pick it up. Good luck - I think it will be very inspirational to other animal lovers (and hopefully potential foster parents) to follow this story. Here's hoping for a very happy ending! WOW - in just a few days you can already see the transformation from timid, unhappy dog in the first pictures, to happy smiley dog in the update. Well done and you'll be amazed at the results. from one foster to another. 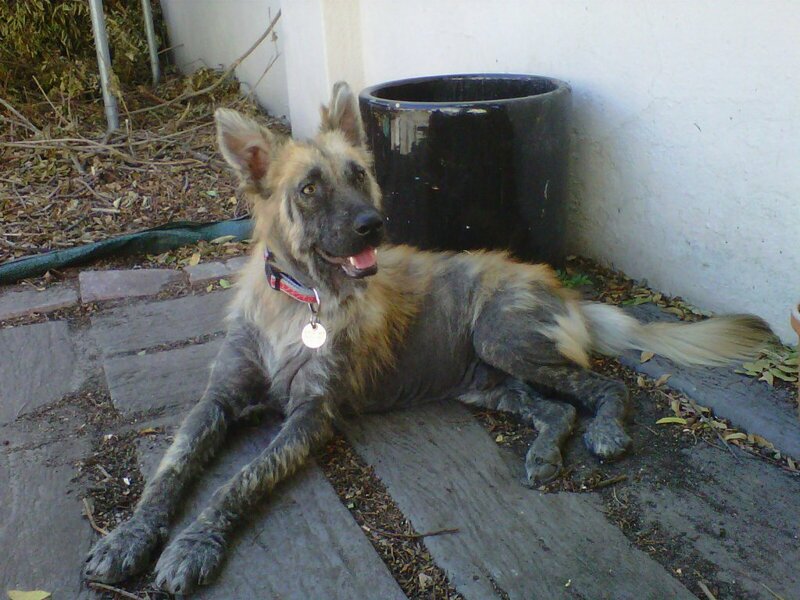 Brilliant idea to blog about your "Extreme Makeover: Dog Edition"!!! The first few days were HECTIC but we survived and you will too. I look at Annie now, sprinting after her Boxer BFF, with a teensy bit of pride that our "pet project" has become a beautiful, affectionate and downright hilarious happy LabX with her uber-cool Ridgeback mowhawk. Best of luck to you and "Smelly"! Hey Richard, my sister Sharon (ex colleague of yours) sent me your blog link - just want to say that I think you are doing an amaaaaazing thing! Well done & I wish you all the best. Will be following the story!